Talitha Khan and her sister Shinga Khan were the first litter of our girl Bahira Khan and dad Nuri Khan. Talitha was born August 2007. 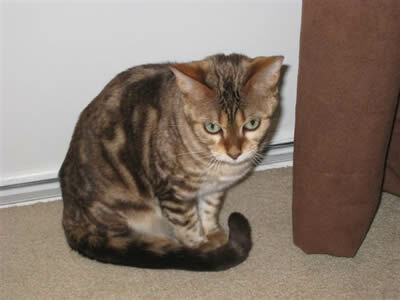 Talitha is a brown spotted Bengal. Talitha like her mom Bahira is a very petite playful girl. She now lives with her new mom Lee-Anne. Shinga Khan is from our first litter of our girl Bahira Khan and dad Nuri Khan. Shinga was born August 2007. 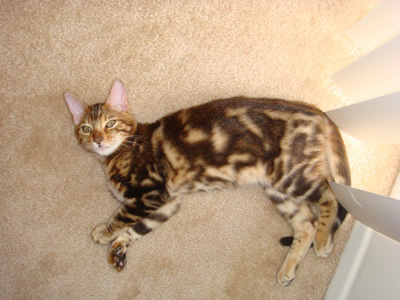 Shinga is a mink marble Bengal. Shinga lives with her cousin Balieu (whose mom is Tasleem) and her new mom Jackie and dad Craig. Shair Khan was born 20 October 2008. 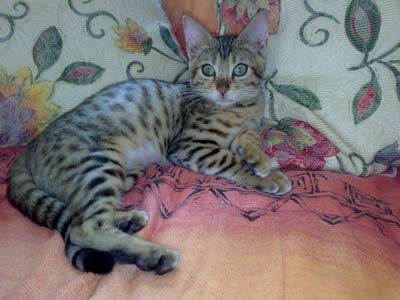 He is a brown marble Bengal from our girl Bahira and boy Razam. Shair was the naughtiest and most active kitten in this litter. He now lives with his new mom Marcia in Washington USA.